Ever find yourself needing a small tool like a screw driver or bottle opener and you don't? Or maybe you are one of the ones lugging around a swiss army knife on your keychain in your pocket. We were recently introduced to a tool that replaces the old swiss army and does more too! 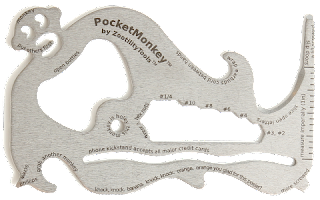 A tool that can do it all but small enough to fit into a credit card slot in your wallet or purse, the Pocket Monkey by Zootility tools can handle multiple jobs and tasks. Pocket Monkey is an all-in-one tool similar to a swiss army knife, without the knife (which is dangerous anyway, right!). It has 12 functions packed into one slim, lightweight tool that can fit in any pocket, purse or wallet. A monkey-shaped piece of metal with rounded edges that serves a purpose besides being a great conversation piece. Pocket Monkey can be used every day as a phone kickstand, bottle opener, peeler, letter opener and door latch slip. Pocket Monkey can be used at work too as a flat screwdriver, hex wrench, micro screwdriver, phillips screwdriver, English ruler and straight edge. I thought this would be something unique and interesting for hubby to have, definitely not something we have ever seen before. He thought it was pretty useful for times he isn't around his tool box for a simple task like changing toy batteries or when he works on fixing computers etc. Lightweight, thin and convenient Pocket Monkey can make a great addition to any handyman's tool collection. You can order yours online at www.zootilitytools.com for $12. Disclosure: Posted by AME on behalf of Pocket Monkey and Zootility Tools. Product was recieved for review purposes. Comments and opinions expressed on this blog are those of the author.